Comprehensive peace in Sudan hinges upon successful, peaceful resolution of the issue of Abyei, the volatile and oil rich area astride the boundary between North and South Sudan. Khartoum’s three-year failure to implement the CPA’s Abyei Protocol has resulted in skyrocketing political tensions, large-scale recent killings, and a rapid military build-up by all sides that caused experts to foresee the resumption of conflict in the region. During my visits in February and March of 2008, I documented the illegal presence of Sudanese Armed Forces in the Abyei area. During this period, the Sudan Armed Forces’s 31st Brigade used terror tactics to systematically clear the population from the villages outside of Abyei town. The village of Todaj, for example, was rendered devoid of population due to nightly shooting by the Brigade. A nearby International Organization for Migration reception center, set up to assist returning people who had been displaced by Khartoum-inspired violence years earlier, was shut down. The tension in the Abyei area was palpable. On May 13, an incident between the Sudan People’s Liberation Army, or SPLA, police and SAF occurred in Dokora village, about four miles north of Abyei. Violence exploded, quickly spreading across the area. On the afternoon of May 14, local officials reported heavy bombardment of Abyei’s civilian areas, as well as looting and burning of markets and homes by SAF forces. This precipitated the mass flight of thousands of civilians to safety in the South. Our first stop in Abyei town was to meet with U.N. civilian staff and the military peacekeepers from the U.N. Mission in Sudan, or UNMIS, mandated to monitor the situation on the ground. Despite their armored personnel carriers, the UNMIS contingent from Zambia was reluctant to move outside its headquarters and civilian U.N. staff did not have the access around town to be in a position to understand its condition. SAF’s 31st Brigade was visibly present in the town and remains so, as of the publication of this report. With assistance from the Joint Integrated Unit, or JIU, and an SPLA detachment, we were able to access much of the town. It was empty. You could look the full length of streets and see no one. I counted only 10-12 civilians, several of whom appeared to be mentally unstable. The others, sneaking back to where their homes once stood, were evidently attempting to salvage any remaining blankets or belongings. The market had been looted and burned to the ground. Many structures were still smoldering. Block after block of traditional homes were reduced to ashes. Approximately 25 percent of the town’s structures were totally destroyed. Shortly after our visit, we received reliable reports that most of the rest was aflame. Abyei, as it had existed several days earlier, had ceased to exist. Although there were a number of civilian casualties, most of the people of the Abyei area were able to flee. Local SPLM officials estimated 106,500 displaced people dispersed southward to nearly 20 sites, such as the town of Agok, a three day walk south of Abyei, where we spent the night of May 16. The vast majority arrived without belongings, and many families had been separated during their flight. Women wailed for their lost children. Although momentarily safe in GOSS-controlled areas, Khartoum’s terror tactics continued. The sound of overflights by the government’s notorious Antonov aircraft, a precursor to bombardment during the decades of the North/South war, further terrorized the population in the Abyei region. The rainy season has begun in Abyei and surrounding areas, with desperate consequences for the displaced. That night in Agok it rained mercilessly and became quite cold. Without shelter, the coughs of infants and old folk began. Our communication with appropriate people in Khartoum, Juba, and Washington appeared to help jump-start an international humanitarian response, already begun by on-site local officials and NGOs such as Mercy Corps and Catholic Relief Services. With international sources now estimating 90,000 people displaced from their homes for at least the second time, Abyei’s former residents will likely require substantial assistance for the foreseeable future. Accounts following our visit detail extensive hostilities between SAF and the SPLA during May, with reportedly substantial casualties on both sides. Although death is commonplace in Sudan, fatalities due to direct fighting between SAF and the SPLA, the military arms of the National Congress Party and the Sudan Peoples Liberation Movement respectively, has been rare since these parties signed the CPA in January 2005. 1. The ultimate cause of this most recent violence is the failure of President Omar Bashir and the NCP to implement the Abyei Protocol of the Comprehensive Peace Agreement. Bashir signed the CPA, including the Abyei Protocol, more than three years ago, and it is now clear that he will not implement it. An array of ghastly consequences could follow from this decision, but the evidence shows he and the NCP could care less. They will have their way. Period. 2. Why is Khartoum getting away with this strategy? The United States has empowered Bashir to take his “devil may care” approach. When it comes to Sudan, the United States is in meltdown mode and Khartoum knows it. The very administration that energetically created the environment that enabled the CPA turned impotent on Darfur and now stands by watching the CPA stagger and twitch. Although the United States literally wrote the Abyei Protocol, the Bush administration has since shown little interest or understanding of the issues, and has actively engaged in a policy of appeasement. Khartoum all the while has pursued a decidedly two-faced approach. Only a couple of days before the Gotterdammerung began in Abyei, the NCP asked that the SPLA be tasked with helping to defend Khartoum from JEM, a Darfur rebel group that recently launched an attack on a suburb city of the capital. The SPLM decided not to fulfill the request, but Salva Kiir did rush to Khartoum while Presidnt Bashir remained safe in Saudi Arabia. Furthermore, while Abyei was burning, Vice President Ali Osman Taha gave a speech at the SPLM political convention, assuring the South Sudan officials that the CPA would be fully implemented. The “Normalization” Initiative: Appeasement in Action? On May 27, the day after the SPLM Secretary General Pagan Amum asserted that because of the Abyei attack, the two parties were “on the verge of civil war,” the SPLM announced that it would not participate in the normalization talks with the U.S. Special Envoy, suggesting that the talks held so far may have emboldened Khartoum to attack Abyei. Normalization talks are scheduled to resume in Khartoum on May 30. Given the absence of a public U.S. government response to the violence and displacement in Abyei, the failure to make any effort to prevent these events, and the clearly stated position that violence in Abyei would bring an end “normalization” talks, the meeting scheduled for the end of May to continue this discussion is deeply worrisome. U.S. government failure to follow through on Abyei has major implications for the prospects of CPA fulfillment and a possible return to war. a. Removes the 31st Brigade and any other illegal Khartoum-affiliated military from the entire Abyei region. First Vice President of Sudan and President of the Government of Southern Sudan Salva Kiir Mayardiit spoke with President Bashir about removal of the 31st Brigade from the Abyei area some weeks ago and received a positive commitment, never fulfilled. Perhaps a joint demand by the United States and its “troika” partners (the UK and Norway), along with the First Vice President, will obtain a more practical positive response. b. Accedes, at minimum, to interim boundaries and an interim administration of the Abyei area in accordance with the Abyei Protocol, without prejudice to a final settlement on these issues, along with a disbursement of the oil revenues due to the Abyei administration under the Protocol, in order to provide services to the area. c. Agrees to fully fund the return of Abyei’s displaced to their now-destroyed homes, properties and businesses, with an appropriate initial deposit to the Government of South Sudan or the United Nations to show good faith within 30 days. Specifically increase its oversight of the executive branch’s actions with regard to Sudan in this period leading up to a transition in administrations. Pursuit of constraining actions by the Congress may be in order. Ensure that the UNMIS presence in Abyei town is reinforced with a permanent U.N. military and civilian presence to effectively monitor the situation, accurately report conditions on the ground, and promote local reconciliation. Those that care about Sudan must be especially alert to the full spectrum of U.S. government activities regarding the entire country. We cannot be parochial. Abyei should matter to all who care about peace and democratic transformation in Sudan. For there to be a solution in Darfur, there must be full implementation of the CPA. For the CPA to bring peace to Sudan, the crisis in Darfur must be addressed. What has just happened in Abyei may turn out to be Sudan’s defining moment. Abyei is recognized by most Sudan experts as a uniquely important bellwether of war or peace between Khartoum and Sudan’s South. Combat directly between the NCP’s military and that of the SPLM has just occurred in this volatile area. Interested parties should have done everything within their power to prevent this. That did not happen. There is still time to prevent a return to full-scale war throughout the entire country. The Bush administration must step up and make sure the international community is doing all it can to bring peace to all of Sudan. The Sudan People’s Liberation Army and its political wing, the Sudan People’s Liberation Movement, fought against the Sudanese government since 1983. A peace deal was signed in 2005. The SPLA is the military arm of the SPLM. The Sudan Armed Forces is the national army of Sudan, but since 1989 it has effectively become the military arm of the ruling National Congress Party in Khartoum. The Joint Integrated Units were stipulated in the 2005 peace deal signed between the North and the South. 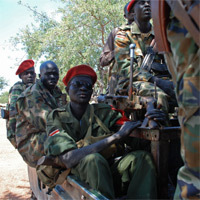 These units consist of equal numbers of SAF forces from the North and SPLA forces from the South and are supposed to help stabilize and secure the country until the 2011 referendum is held.